BEULAH, N.D. – Drought in North Dakota is laying waste to fields of normally bountiful food and hay crops and searing pastures that typically would be home to multitudes of grazing cattle. Some longtime farmers and ranchers say it’s the worst conditions they’ve seen in decades – possibly their lifetimes – and simple survival has become their goal as a dry summer drags on without a raincloud in sight. “We’ve never been in this sort of boat, honestly,” said Dawn Martin, who raises beef cattle with her parents and husband in the southwestern part of the state, an area the U.S. Drought Monitor says is in “extreme” drought. The drought’s impact will be felt not just by farmers but also consumers, state Agriculture Commissioner Doug Goehring said. Agriculture in North Dakota is an $11 billion a year industry, and the state leads the nation in the production of nearly a dozen crops. John Weinand has had less than 2.5 inches of rain on his farm near Beulah, which is northwest of Bismarck, since the beginning of May. He’s used to getting more than 3 inches in June alone. Weinand figures his wheat crop will be half what it usually is. As for his field peas, he expects to harvest fewer than 100 pounds per acre, compared with a typical 3,000 pounds per acre. He won’t even try to sell his barley; he’s already rolled it up into hay to feed his cows. “If we get some rain we’ll have some corn and soybeans, but at this point it doesn’t look very promising,” he said. The Martins have sold off about one-third of their cattle because the grass in their pastures is brown and brittle and they’ve already started dipping into winter hay reserves. They’ll likely send their remaining animals to a feedlot for the winter, but they might need to find second jobs to cover the expense. “What we’re trying to do is hold onto our main cow herd, get through the year, and hopefully next year is better,” Martin said. The situation is much the same across ranching country, with the best hay production about a fourth of normal. In pastures where grass might typically be 2 feet tall, “now we’re talking grass that if you laid a pop can on its side, it would be taller,” Goehring said. 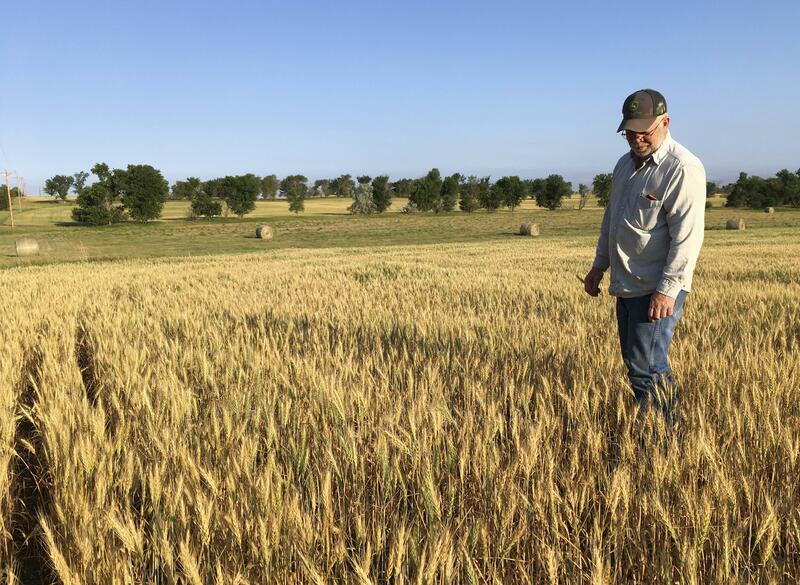 More than one-third of North Dakota’s staple spring wheat crop and nearly three-fourths of the state’s pasture and rangelands are rated in poor or very poor condition, according to the U.S. Department of Agriculture. USDA estimates spring wheat production will be down 27 percent from last year; oats, barley, durum wheat and winter wheat also will be down dramatically. The production reports released Wednesday for South Dakota and Montana are much the same. That helps, but doesn’t cover everything, Goehring said. Neither does crop insurance, which pays only a portion of what a farmer would get by selling a typical crop, said Goehring, who in addition to heading the state Agriculture Department is a farmer who has worked in the insurance industry. Hay is in great demand – a North Dakota State University website that helps match hay buyers with sellers lists nearly 60 ranchers seeking hay. The demand has pushed prices to as much as double the normal cost. Published: July 15, 2017, 10:36 a.m. Updated: July 15, 2017, 4:54 p.m.